Silicon Valley and Wine Country are both within the Bay Area, which is a region in Northern California that includes the three big cities of San Francisco, San Jose, and Oakland and the counties of Napa, Contra Costa, Santa Clara, Solano, Alameda, Marin, San Mateo, San Francisco, and Sonoma. Substance abuse and dependency affect California residents at rates just above the national averages as a whole, with averages between 2009 and 2013 indicating that 2.9 percent of the population was dependent on or abusing drugs and 7.3 percent were abusing or dependent on alcohol. A quarter of all Californian adults (aged 18 and older) will experience mental health issues in any given year. In 2009, 7 percent of resident adults in the Bay Area battled a serious mental illness (SMI). Mental illness and substance abuse are often both treated by mental health, or behavioral health, services, as these issues often co-occur. Only about a third of California adults with mental health concerns will attempt to get treatment each year, however. Methamphetamine is a growing concern in the Bay Area, and close to 500 more people were admitted for meth abuse or dependency treatment in 2012-2013 than the year before. Meth ED visits in 2011 were much higher in San Francisco than the rest of the country as well, at 139.5 per 100,000 population versus 33 per 100,000 population. Methamphetamine is the number one drug seized and analyzed by Bay Area National Forensic Laboratory Information Systems (NFLIS) labs, with reports increasing from the first six months of 2012 to the same time period in 2013. Medical marijuana is legal in the state of California, making marijuana fairly accessible in the Bay Area. Illegal grow operations in rural Northern California may attempt to stay in the shadows of legal cannabis cultivators and marijuana producers. Mexican drug trafficking organizations (DTOs) also may be smuggling marijuana across the border and into port via boat; via car, truck, or commercial vehicle on the way to the rest of the Pacific Northwest and Canada; or even through the air on a plane at one of the regions many airports. Marijuana was the second most seized and NFLIS lab-reported drug in the San Francisco Bay Area in 2013, although numbers were almost half of the national average for seizures and NFLIS drug reports for the same period of time. Marijuana may be easy to obtain in California, as it is generally not difficult to receive a medical marijuana card, meaning many users are already likely using the drug recreationally regardless of what the law says. Although treatment admissions are fairly low for marijuana dependency in the Bay Area, treatment rates are higher for young users and youth than other age groups. Almost half of all individuals listing marijuana as a primary drug of abuse were 18 or younger. One of the precursors for drug abuse is commonly availability. Doctors in the Bay Area may prescribe opioid narcotics, and particularly hydrocodone products, at rates much higher than in other parts of the country. Hydrocodone was the number one prescribed drug in 2012 in the United States, with over 125 million prescriptions written. In 2014, in the Bay Area alone, prescriptions for hydrocodone reached 1.4 million. Hydrocodone products, which include Vicodin and Lorcet, are prescribed to treat pain and serve to block pain sensors while depressing parts of the central nervous system. They also are highly addictive, and over time, an individual taking an opioid painkiller can become used to the amount taken, leading the person to need to take more in order for it to continue to work. This can lead to a dependence on opioids, and doctor-prescribed amounts may no longer be enough, leading the person to increase dosages without medical supervision. In Contra Costa, San Francisco, Marin, Alameda, and San Mateo Counties in 2014, approximately 5.6 percent of residents over the age of 12 took prescription opioids for nonmedical purposes, or in other words, recreationally abused them. Sale of opioid pain relievers quadrupled between 1999 and 2010, and overdose deaths involving these drugs tripled. Prescription opioid drugs are abused at epidemic levels throughout the United States. Many measures have been enacted by the government, law enforcement, and even makers of the pills themselves to try and keep these medications from being diverted and abused. Taking effect in October 2014, hydrocodone was officially reclassified by the U.S. Drug Enforcement Administration (DEA) from a Schedule III controlled substance to a Schedule II controlled substance. This means that tighter regulations were put in place for prescribing it, and higher penalties are given for those convicted of diverting it. As prescription opioids become harder to get, individuals addicted to them may turn an illegal, and often cheaper, street substitute: heroin. In the past, heroin abusers were thought to lurk in the shadows of alleys and in low-income and urban areas. Today, the face of the typical heroin abuser is changing. Almost half of heroin abusers in 2013 were also addicted to an opioid painkiller, and heroin use among those between 18 and 25 years old more than doubled in the past 10 years, although use has increased across almost all age brackets and socioeconomic groups. In Santa Clara and the counties surrounding the area, seizures of heroin spiked from 6.3 pounds in the first six months of 2012 to 22 pounds in the first half of 2013. In addition, 6.4 percent of the drugs analyzed by the National Forensic Laboratory Information Systems (NFLIS) labs in the Bay Area were reported to contain heroin.,  In San Jose, the DEA reported a 249 percent jump in heroin seizures between 2012 and 2014. As availability of heroin in the Bay Area increases, the price drops, making the drug more attractive to a variety of individuals addicted to opioids. Many users are financially stable and privately insured. Substance abuse treatment centers in San Francisco report that individuals admitted report heroin as their primary drug of abuse above all other drugs and second to only alcohol in treatment admissions. 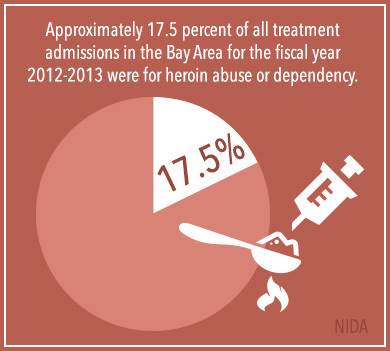 Approximately 17.5 percent of all treatment admissions in the Bay Area for the fiscal year (FY) 2012-2013 were for heroin abuse or dependency. Many drug users in the Silicon Valley area may not be seeking a “high.” Instead, they may be seeking an “edge” or a way to stay awake, focused, and alert for longer – to increase work production in demanding and high-powered jobs. Stimulant drugs may seem like an alternative and more effective option than highly caffeinated drinks, such as energy drinks or mugs of coffee. Stimulants may include prescription attention deficient hyperactivity disorder (ADHD) medications like Adderall or Ritalin, or illegal drugs such as cocaine. In San Francisco, San Mateo, and Marin Counties, 159 people per every 100,000 go to an emergency department (ED) each year for treatment related to stimulant abuse. In comparison and stark contrast, the national average of ED visits for stimulant abuse is 30 per 100,000 population. Cocaine abuse has been steadily declining in recent years in the Bay Area, although in the FY 2012-2013, it still ranked fourth in total treatment admissions at 14 percent of all substance abuse treatment admissions for the year. In addition, 15 percent of drugs seized and analyzed by local NFLIS labs contained cocaine in the first half of 2013. Getting treatment for a substance abuse or mental health issue, or both, can literally save a life. Suicide may be a side effect of untreated mental illness symptoms. On average, between 2008 and 2010, about 10 per 100,000 population in the greater Bay Area committed suicide. In 2013 alone, almost 50 people jumped to their deaths off the iconic Golden Gate Bridge in San Francisco, a record-high number. Substance abuse can make mental health symptoms worse also. Drug overdose is a real risk when abusing drugs, and in 2013, in Alameda, Contra Costa, San Mateo, and Santa Clara Counties, 220 people died from a fatal opiate overdose, almost a 90 percent increase over a 10-year period. Overdoses are not always fatal, and another 346 individuals were treated for opiate overdose in a local hospital in the same counties in 2013. Prevention methods and education are the first steps in mental health and substance abuse treatment models. Most local communities will have an outreach program in the area designed to offer family and youth services at the very least. The Mental Health Association of San Francisco (MHASF) compiles and produces a list of both emergency and non-emergency services with hotlines to call in case of a crisis as well as links and information on other local mental health services in the area. The San Francisco Department of Public Health serves residents of the city and county of San Francisco battling substance abuse or addiction. 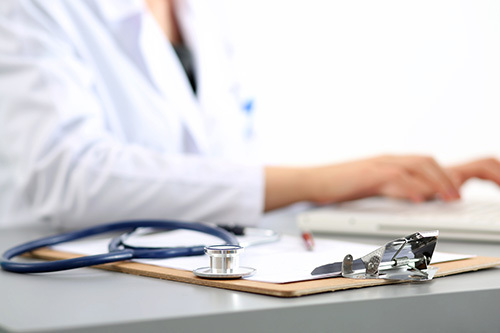 The organization keeps a list of contracted providers for services on their website. In Alameda County, the Alameda Council of Community Mental Health Agencies (ACCMHA) has 32 contracted nonprofit and community organizations to offer mental health and services for co-occurring disorders to local residents through Alameda County Behavioral Health Care Services (ACBHCS). The Alameda County Behavioral Health Care Services (ACHBCS) also has a crisis line for emergencies as well as links to and information on local public treatment options. The Contra Costa Behavioral Health Services provides its residents with a plethora of relevant details regarding substance abuse and mental health services as well as contact information for local programs and crisis intervention. A division of the Marin Health and Human Services Department, the Mental Health and Substance Use Services (MHSUS) offers residents intervention and prevention services as well as crisis services and residential or outpatient substance abuse and mental health programs for Marin Medi-Cal insured or uninsured residents. The County of San Mateo Health System provides Behavioral Health and Recovery Services Contacts for all local substance abuse and mental health needs. The County of Sonoma’s Department of Health Services Behavioral Health Division is a resource for local organizations and crisis intervention programs as well as mental health and substance abuse treatment services. Working with local organizations, providers, and hospitals, Napa County Mental Health fosters a partnership with a variety of program providers in order to provide residents comprehensive and integrated mental health and substance abuse treatment services. With links to resources and self-help options Mental Health Services of Solano County offers its residents an easy-to-navigate website full of mental health and substance abuse information and access to immediate crisis services. The Mental Health Department of Santa Clara County provides a phone number to call for mental illness treatment information as well as Quick Links for local mental health services information. Santa Clara County also has a Network of Care for Behavioral Health service provider locator tool in order to help residents find specific types of mental health or substance abuse treatment programs. Treatment programs vary in type and range of services offered. Private substance abuse and mental health treatment programs may be more flexible and comprehensive in nature. Services are generally either inpatient or outpatient and may include detox, rehab, recovery services, therapy, counseling, and support groups. >Support Systems Homes: This San Jose addiction treatment provider offers a number of addiction treatment options, including medical detox, residential care, day treatment, and outpatient treatment. Addiction education, counseling, 12-Step support work, aftercare planning, and alumni support are all available through this program. Since addictions and poverty so often go together, the team works hard to ensure that plans come at an affordable price. New Bridge Foundation: In 1968, this organization was founded. 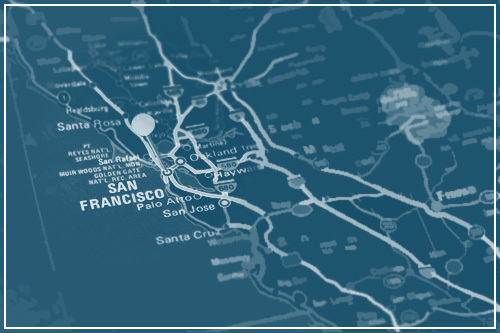 The team offers a full suite of services to people living in the San Francisco area, including residential care, outpatient care, day treatment, and addiction interventions. The care provided is solution-focused and results-oriented. The treatment team is licensed and qualified, and the staff is capable of handling addictions that are complicated by mental illness. There are special programs for military families. Aftercare is free. Life Choices: This San Jose treatment provider offers care for adult men and women. Residential care is provided in a 31-bed sober living home. People who enroll work with professionally trained staff members who are available around the clock to help. People who enroll are expected to participate in therapy, engage in support group meetings, and perform meaningful social activities. Rules are rigorous, and they are designed to provide structure to the sobriety journey. Positive Progression: Medical detox followed by intensive addiction rehab is available through this organization. People who enroll spend several days under the care of licensed medical detox professionals, and then they move on to 30 days of residential care. That treatment is followed by several months of outpatient care, which consists of evening sessions and therapist contact. There is a family program available too. New Life Recovery Centers: Addiction care at a reasonable price is the goal of this organization. Medical detox, residential addiction care, day treatment, outpatient treatment, and sober living homes are all available through this provider. Care is available for almost every level of addiction. Staff keeps a close eye on the recovery process, and the team changes the treatment plan depending on the needs of the person enrolled in care. Insurance plan payments are accepted. < strong>: This organization uses a social immersion model to help people with addictions. Those who enroll move right into a treatment program that provides daily group sessions and 12-Step meetings. Contact with the outside world is limited during this program to surround the person with sober peers. Those who do not need this level of immersion can enroll in outpatient programs instead. Some programs are offered at no charge while others come with a sliding scale of fees. The Addictions Institute: Private counseling for addiction is available through this treatment provider. The team provides an individualized assessment and diagnosis, followed by individual counseling on a one-on-one basis with a trained and qualified professional. The team also assists with additional problems that can come in concert with addiction, including marriage dysfunction and parenting difficulties. Second Chance: This treatment provider offers individual counseling for addiction issues on an outpatient basis. The care begins with an assessment with a trained professional, and the meetings are scheduled around the person’s work and family obligations. That work is augmented by abstinence support group meetings, held several times each weekday. The Freedom Center: Outpatient care for addiction is provided by this organization, which is located in Redwood City. The team performs an assessment to start the healing, and treatment consists of individual and group counseling sessions. Appointment times vary and are flexible. Ongoing care programs are available. Drug testing services are also available. The team speaks both English and Spanish. Summit Estate Recovery Center: Customized care for addiction is available through this treatment facility. The team can provide residential care for those who need constant supervision, and there are outpatient programs for those who can handle a bit of additional freedom. The team uses a neurosciences approach to help people understand how to keep an addiction issue from coming back. The Center for Harm Reduction Therapy: Individual therapy for substance abuse is available from this addiction treatment provider. The team meets with clients to discuss their addiction concerns, and together, a therapist and client come up with a recovery plan that is reasonable. For some, that involves sobriety. For others, that involves tapering. There are trauma-specific treatments, medication management services, and group therapy sessions available too. BAART Programs: Medication management for opiate and opioid addiction is the primary focus of this addiction treatment provider, but the group can also offer individual and group counseling for people who have addictions. There are several offices in the Bay Area to choose from. Reflections Luxury Rehab: Residential addiction care in a luxurious setting is the focus of this addiction treatment provider. There are special programs for executives, allowing people to continue with a high-powered job while they heal. There are also services available for those who have mental illnesses in addition to addiction. Care is provided by professionals with doctoral degrees. Weekend therapeutic adventure activities are built into the program price. Ohlhoff Recovery Programs: Inpatient and outpatient addiction care is available for both men and women through this treatment provider in San Francisco. Inpatient programs last between 30 days and 12 months, while outpatient care lasts for 13 weeks. There are outpatient programs available for adolescents too, and those last for eight weeks. Priority is given to families facing a crisis due to an addiction issue. Metropolitan Fresh Start House: Faith-based residential treatment for drug addiction is available through this provider. The team offers individual treatment plans that might include individual counseling, group counseling, family counseling, relapse prevention counseling, parenting classes, marriage classes, anger management classes, and more. The program is ideal for men who are dealing with both addictions and homelessness. Community Awareness and Treatment Services: Homeless men and women living with addiction can get help through this program. The team offers a continuum of care that includes safe and sober housing, referrals to treatment programs, transportation to addiction appointments, and ongoing staff support. The goal of these services is to help people to move past addiction and into a life that is productive. Project Ninety: Residential treatment for substance abuse is provided by this treatment provider in San Mateo. The team uses a social model of care, meaning that everyone who is enrolled is expected to help everyone else who is enrolled. And people who are enrolled have access to a team of counselors who can provide education and support on the nature of addiction and recovery. Support group work rounds out the services provided. Addictions in the Bay Area do not have to persist. With the help of a treatment program, even advanced cases of addiction can be addressed in a comprehensive and compelling way. There are programs that can help. Families should take advantage of that help and call for more information today. (2015). “Behavioral Health Barometer, California 2014.” Substance Abuse and Mental Health Services Administration (SAMHSA). Accessed October 1, 2015. (Sept. 2012). “Picture This: Mental Health in the San Francisco Bay Area.” Entertainment Industries Council (EIC). Accessed October 1, 2015. Gelghorn, A. Ph.D. (Feb. 2014). “Drug Abuse Patterns and Trends in the San Francisco Bay Area- Update: January 2014.” National Institute on Drug Abuse (NIDA). Accessed October 1, 2015. Gelghorn, A. Ph.D. (June 2014). “Drug Abuse Patterns and Trends in the San Francisco Bay Area- Update June 2014.” Community Epidemiology Work Group. Accessed October 1, 2015. (Sept. 2011). “Northern California High Intensity Drug Trafficking Area (HIDTA). Drug Market Analysis 2011.” U.S. Department of Justice (DOJ) National Drug Intelligence Center (NDIC). Accessed October 1, 2015. Kovaleski, T. (Feb. 2015). “Medical Marijuana is Already Recreational, Insiders Say.” NBC Bay Area. Accessed October 1, 2015. Perrone, M. (Aug. 2014). “New Restrictions on Hydrocodone to Take Effect.” USA Today. Accessed October 1, 2015. May, P., Somerville, H. (July 2014). “Use of Illicit Drugs Becomes Part of Silicon Valley’s Work Culture.” San Jose Mercury News. Accessed October 1, 2015. (Aug. 2014). “Rules 2014.” U.S. Department of Justice (DOJ) Drug Enforcement Administration (DEA) Office of Diversion and Control. Accessed October 1, 2015. (July 2015). “Today’s Heroin Epidemic.” Centers for Disease Control and Prevention (CDC). Accessed October 1, 2015. Ho, V. (Feb. 2014). “Golden Gate Bridge Suicides Hit Record High- 46.” SF Gate. Accessed October 1, 2015. Ioffee, K. (Sept. 2014). “Opiate Overdoses: Painkillers’ Toll Steadily Rising in Bay Area.” San Jose Mercury News. Accessed October 1, 2015. (2015). “Mental Health Association of San Francisco (MHASF).” Mental Health America (MHA). Accessed October 1, 2015. (n.d.). “Substance Abuse Services.” San Francisco Department of Public Health. Accessed October 1, 2015. (2015). “About ACCMHA.” ACCMHA Alameda County of Community Mental Health Agencies. Accessed October 1, 2015. (2008). “Behavioral Health Care Services (BHCS).” BHCS Website. Accessed October 1, 2015. (2015). “Contra Costa Behavioral Health Services.” Contra Costa Health Services. Accessed October 1, 2015. (n.d.). “Mental Health and Substance Use Services.” Marin Health and Human Services. Accessed October 1, 2015. (2015). “Behavioral Health and Recovery Services Contacts.” County of San Mateo. Accessed October 1, 2015. (n.d.). “Behavioral Health Division.” County of Sonoma. Accessed October 1, 2015. (2009). “Welcome to Mental Health.” Napa County CA. Accessed October 1, 2015. (n.d.). “Mental Health Services.” Solano County California. Accessed October 1, 2015. (2015). “Mental Health Department.” County of Santa Clara SCC Gov. Accessed October 1, 2015. (2015). “Santa Clara County Mental/Behavioral Health.” Network of Care. Accessed October 1, 2015.